Autumn at Halsway is a time of mists and mellow fruitfulness, as we gather in our energies ready for the dark nights. Led by Tracey Roberts, come and share in some yoga, meditation and deeply nourishing relaxation in the cosiness of log fires and good company. With some walking and creative playing in the breathtaking landscape of the Quantock Hills and coastline and – new for this year – a chance to release your voice and enjoy some singing together! Wellbeing is about learning to pay more attention to our mind and body and the world around us. Each day we’ll explore our inner and outer worlds, playing with the natural rhythms of silence and sound, movement and stillness. As always at Halsway, there’ll be a warm welcome, good nourishing food, time to relax in the bar by an open fire, space to be quiet and time to make new friends. Bring a yoga mat (if you have one), loose comfortable layers for the yoga, and sturdy walking boots and outdoor clothes for the walks. If you enjoy writing or sketching, bring some materials with you as there’ll be opportunities to respond to the landscapes we explore, with easy activities to join in with if you’re a complete beginner. The focus is on fun and having time and space to be playful, creative, to learn new things and to explore wellbeing as both an individual and shared experience. 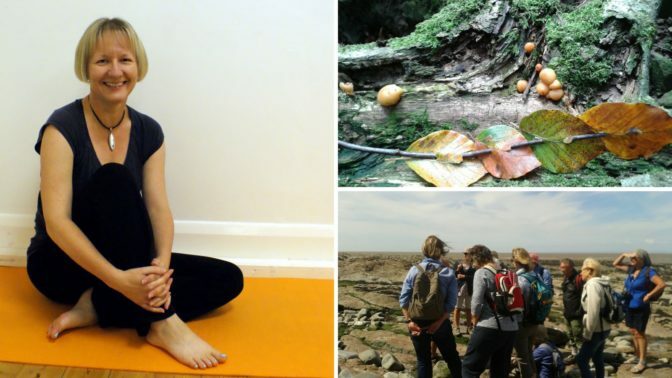 The Wellbeing Week with Tracey is running alongside a Musicians Retreat led by Laurel Swift. There will be times during the programme where both groups come together to share sessions and activities, as well as times – including extended morning sessions – when each group works independently. We think this will allow you a balance of focussed engagement, together with more relaxed and social activities with a wider group of participants. It also means that Tracey and Laurel can share their considerable skills and experience to the benefit of both groups. Monday: Arrive from 4pm, dinner at 6.30pm. Followed by a gentle, meditative practice to relax and release from your journey. After lunch in the Manor, we’ll join Laurel and her group for walks in the hills and on the beach. There’ll be opportunities to learn and be creative, guided by Tracey and Laurel, or just to walk and enjoy the outdoors. Andy King, consultant geologist / ecologist from Geckoella will join the group for one of the walks. We’ll come together again for some singing, and then after dinner we’ll gather for meditation and guided relaxation. Also in the evenings there’ll be a bit of dancing in the mix, plus time to socialise in the bar, or to find a quiet moment to yourself. The yoga practices will be exploratory, mindful, nurturing and fun. Everyone works at their own level, so sessions are suitable for all, from experienced students of yoga, to beginners. We’ll explore yoga movements, breathing practices and meditation. The afternoon walks will be fun and creative, with no experience needed. The hill walk includes one steep climb and descent and requires a reasonable level of fitness, but we’ll take our time. A walking pole will be useful in case it’s muddy. Car sharing will be necessary for the beach walk. The vocal warm-up and singing sessions are designed to encourage the complete beginners amongst us, and to enjoy having a go! Laurel Swift is an inspiring performer, composer and workshop leader. Laurel is the founder and choreographer of Morris Offspring, one half of ‘Under her Skin‘ with performance storyteller Debs Newbold, and plays with Gadarene, Ben Moss, and The Gloworms. She has been involved in many creative folk arts projects, and is currently lead tutor for London Youth Folk Ensemble, and regularly leads workshops for EFDSS adult and youth programmes.